TORONTO - Up until Tuesday night, when he caught a glimpse of Ricky Romero’s name as that evening’s Toronto starter, Clay Buchholz thought he had avoided his recent fate. He thought he would be pitching in this series against Romero, a pitcher having a good year, but certainly not having a year the caliber of Roy Halladay’s. But Buchholz, fortunately or unfortunately, was wrong. Buchholz, though, could have been excused for an exasperated sigh or two. Another ace? But Buchholz never complained, not after he allowed just two runs in six innings to the Yankees and suffered a loss, not after he allowed just two runs in seven innings to the Tigers and suffered a loss. Not after facing CC Sabathia and Justin Verlander in his last two starts. Not even after he drew Halladay last night. And any thoughts of self-pity were surely gone after his outing. Buchholz both outlasted and outpitched the Blue Jays’ Cy Young contender, resulting in a 6-1 Red Sox win at Rogers Centre. “I felt really good the last three times out,’’ Buchholz said. “Went up against, even tonight, went up against a guy that’s in the running for Cy Young candidate. It’s hard to go out there and expect a lot of run support, so you want to keep the runs to a minimum. That left the Sox with the potential for a rare road sweep with Jon Lester on the mound against Brett Cecil tonight. Plus, paired with a Rangers loss to the Twins last night, the win put the Sox ahead by a game in the wild-card standings - and continued with the education of a young pitcher who seems to be getting the hang of the major leagues. Using his changeup as his out pitch, as he has most of this season, Buchholz survived two innings in which he allowed three base runners. In the fourth, he had runners on first and second with one out and one run in (on Vernon Wells’s single to right). But Buchholz struck out Randy Ruiz swinging, and got Edwin Encarnacion to ground to second to end the inning. He got out of it again in the sixth, after allowing three singles to load the bases with two outs before retiring Encarnacion again, this time Encarnacion slamming his bat down on the turf in frustration. The third baseman flied out to center field, ending the inning and finishing off the last real chance the Blue Jays had against any Sox pitcher. Of that second Encarnacion at-bat, Buchholz said, he “was in hitter’s count [2-and-0], and I didn’t want to go 3-and-0 on him. Threw a fastball that was probably a hittable pitch, and it’s still a hard thing to do to hit a round ball with a round bat. Coupled with his teammates’ ability to score five runs off Halladay, it resulted in a win. The authors of those runs have become predictable over the past week. Both David Ortiz and Jason Bay have turned hot, and both homered last night. 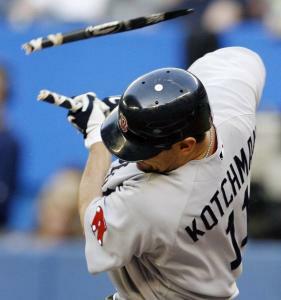 Ortiz started the scoring with a homer to lead off the second inning, then the Sox got another run on a single up the middle by Alex Gonzalez that followed a Casey Kotchman single and stolen base. Another run came in the fourth, on an RBI triple by Jacoby Ellsbury. Then Bay found his power stroke, blasting a Halladay pitch to the right of the foul pole in left field for a two-run homer. Two outs later, after five innings, Halladay was done, out in less than six innings for the first time in 42 straight non-injury starts. It was, in fact, only the third time this season that Halladay hadn’t reached the seventh inning - and the other two involved an injury and his first start after the injury.